Broadcast on Channel 5 (UK) 05 April 1997 Sat 4:40 a.m.
Mum dreams of Wentworth - including Meg sporting an insanely cheesy grin - but she wakes up to find that she's at Lorraine and Ron's . She has to pretend to be her daughter's Aunt Violet as Lorraine has told her children, Judith-Ann and Andrew, that their grandmother is dead. Meg speaks harshly to Lynn, telling her that she doesn't believe she's innocent so she ought to give up the hunger strike. Franky makes Lizzie get up from her seat at the card table, claiming she's sitting in her place. Eddie is told he must stick to the agreed work areas rather than "fraternise" with the prisoners. A dance class creates a confrontation between Bea and Franky, when Franky asks Jaren to dance and Bea steps in, claiming she's already booked her. Despite Karen's fear of a fight, Bea and Franky just stand and glare at each other. Doreen keeps watch while Marilyn talks to Eddie: she tells him they have to be careful as she doesn't want to end up like Rosie (i.e. pregnant). Marilyn tries to get Greg to prescribe her the pill claiming that she'd been having headaches since she stopped taking it, but he refuses. During her own medical examination, Greg lets Karen have a liedown on his couch and she has another flashback: to her romance with Greg; her husband's insistence that she have an abortion despite her Catholic faith and to her arrest after she murdered her husband and phoned the police to confess. Lynn digs a hole under the fence. Bea reads the tea leaves and uses it to warn Doreen off Franky and to tell Marilyn to be careful with Eddie. Greg warns Eddie he could lose Marilyn her good conduct report. Lizzie pockets a bottle of surgical spirit while Greg's back is turned, replacing it with an identical empty one. Meg accuses Officer Yates of dealing drugs to Marilyn, but the "drugs" she is caught supplying are identified by Greg as contraceptives. Nevertheless, Officer Yates is suspended by Erica, and in response she resigns. Erica has a quiet word with Meg about her harsh attitudes since Bill's murder. Karen pleads with Lynn to give up her silly plan to escape by digging under the fence. Marilyn shows Bea she has kept some of the pills back rather than hand over the lot. Mum pretends she has found somewhere else to live and leaves home. Lynn is caught burying a bag to fill in the trench by Meg and Vera. Judith-Anne overhears a conversation and realises that her great-aunt is really her grandmother. Mum's parole officer comes to tell Lorraine that she has been arrested for stealing some jewellery to get back inside Wentworth with her friends. When Lynn collapses through weakness after her hunger strike, Greg's examination reveals that she is pregnant. This is as much a surprise to Lynn as to anyone else, and she realises that the father must have been the man who raped her. A little seen background prisoner at the dance class . 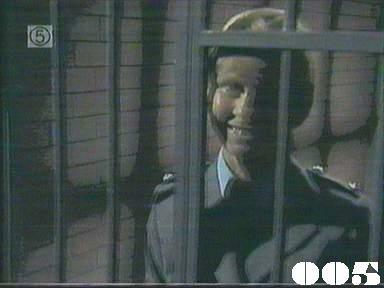 In the final credit sequence, another officer takes over Officer Yates' locking up duties.